For the past several decades, individuals with disabilities have been receiving far better treatment and acknowledgment in our society. To increase access for individuals with physical disabilities, many locations have been transforming their indoor spaces following universal design principles to allow complete accessibility. Schools and nonprofit organizations have been designing special education curriculum to increase cognitive development for individuals with cognitive disabilities. Sensory stimulation has been found to be a critical factor in cognitive development, and is utilized heavily in special education classrooms today. As more research is conducted on varying disabilities, our knowledge on how to improve the lives of people with disabilities increases. As our team’s abilities increase, it becomes imperative to create a universally designed environment, to have both indoor and outdoor spaces that focus in both sensory stimulating capabilities and accessibility. Seven Hills Foundation is dedicated to providing integrated clinical, educational, and community based support to children and adults with disabilities and significant life challenges (Seven Hills Foundation, 2017). The Seven Hills Foundation is an affiliation between twelve different locations across the New England area. 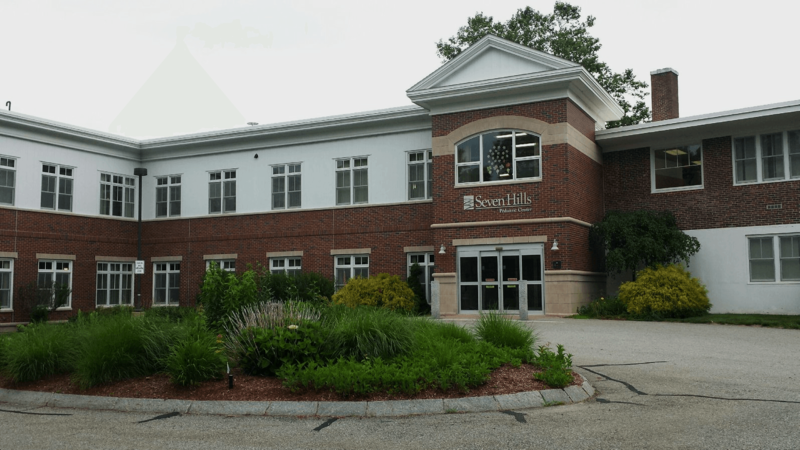 Seven Hills Pediatric Center, located in Groton, Massachusetts (see Figure 1), provides long-term, continuous nursing care and short-term respite care to children and young adults, as well as sub-acute care to those above 18 years of age. This specific facility was our focus for this project. The interior of this facility had been recently renovated, and received state-of-the-art technology and resources for assisting in cognitive development of the residents. During these renovations, the outdoor areas surrounding this facility did not receive the same level of improvements, and were not kept to the same high standards as the indoor areas. Three main areas outside of Seven Hills Pediatric Center, colloquially known as the Koi Pond area, the Walmart Plaza, and the Gazebo area, had some interactive features, though these features were not easily accessible to most of the residents, and did little to assist in cognitive development. Figure 1: Seven Hills Pediatric Center, located in Groton, Massachusetts. The goal of our project was to assist Seven Hills Pediatric Center by designing an outdoor interactive space that incorporated universal design principles and appealed to the cognitive growth and development of the residents through sensory stimulation. Upon completion of this goal, we offered the designs and prototypes of recreational activities that integrate developmental aspects and accommodations for individuals with various levels of cognitive, physical, and developmental abilities. To complete this goal, we engaged in a human centered design approach following five key objectives: identifying the physical needs and requested accommodations of the residents at Seven Hills Pediatric Center, determining design criteria for an interactive space, developing landscape architectural designs and multi-sensory stimulating features, evaluating blueprints of proposed landscape features and creating prototypes, and finally fundraising opportunities to assist in providing features. Before identifying the needs of the residents at Seven Hills, we were able to visit several sensory gardens and healing gardens, and create a preliminary list of possible features we could implement. Upon completing this step, we used our insight into the needs of the residents and staff at Seven Hills to generate a concrete list of features to implement, as well as include more aspects that we initially overlooked, specifically shade and reducing direct sunlight. The final outcome of this project was the preliminary stages of renovation of the Gazebo area, construction of one of our proposed features, and a series of recommendations for future features to be installed. We were successfully able to remove two features that were not easily accessible or otherwise unusable. Figure 2 depicts the two removed features, a musical installation that most residents could not directly use themselves, and a bridge feature that was too steep for any residents to use. Figure 2: Two features that were successfully removed. The feature on the left is a musical installation holding triangles, and was difficult for residents to use independently, as well as being far too loud. The feature on the right is a bridge, that was too steep and dangerous for residents to use. Along with the deconstruction of these two features, we were successfully able to construct a vertical garden, which contains several different heights of plants to allow all people to be able to enjoy the garden. This specific design, shown in figure 3, features a variety of multisensory plants to stimulate touch and smell, along with sight. Figure 3: Vertical Garden: The left image shows a three dimensional blueprint of the vertical garden. The right image shows the fully constructed vertical garden at Seven Hills Pediatric Center. Finally, we were able to produce a three dimensional rendering of the placement for several other features that we recommended implementing to improve the overall quality of the outdoor space around the gazebo area. As seen below in figure 4, the final design includes two vertical gardens, two elevated garden beds, a circular fountain, and a pergola for shade. The recommendations we list for Seven Hills Pediatric Center include detailed explanations for our rationale behind each feature we selected, as well as listing ideas, concerns, and notes for purchasing, installation, and maintenance of each feature. 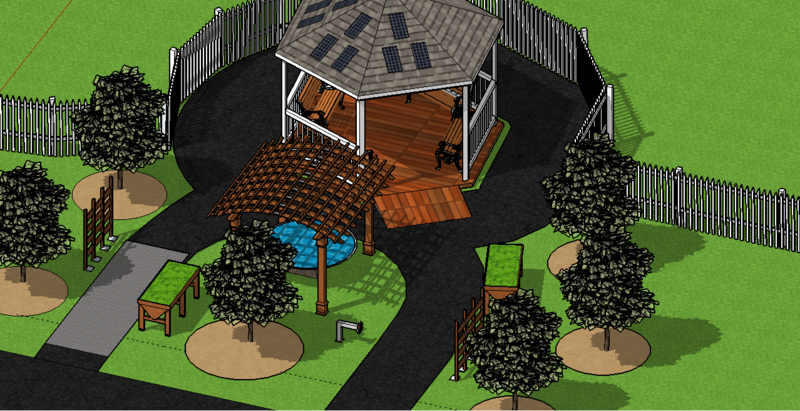 Figure 4: Finalized landscape architectural design for Gazebo area. This design features two vertical gardens, two elevated garden beds, a circular fountain, and a pergola. By successfully achieving our goal of designing an interactive space that appealed to cognitive growth and development, we hope to grant Seven Hills Pediatric Center the possibility of drastically improving their outdoor environment. Upon complete installation of the features we recommend, we hope to have created a space that not only stimulates cognitive awareness and all five sense, but that is truly enjoyable to spend time in. We hope that our design successfully meets all of the requirements of the residents and staff of Seven Hills.